Pulses are nature's precious gift to mankind as it supplements nutritional (protein) requirements of humans for pre-dominantly vegetarian population of the country, feed to cattle, and nitrogen to the soil. The potential of pulses to help address future global food security, nutrition and environmental sustainability needs has been acknowledged through the UN declaration of the 2016 International Year of Pulses. These crops are highly water efficient and can be grown in marginal land with a minimum use of resources. Although, being the largest pulse producer and consumer country in the World, the per capita availability of pulses is very low at 16kg/year and continuously declining over the years. Given the generally poor levels of nutrition and health (reflected in stunting rates), increasing protein consumption is a high policy priority. The annual pulses production in the country is ranging from 16-22 million tonnes (mt) during last five years. Chickpea alone contributes 41.20 per cent to the total pulse production and 32.36 per cent of area in the country followed by pigeon pea (19.83% of production and 17.26% of area), black gram (13.05% of production and 14.52% of area) and green gram (9.62% of production and 13.24% of area). The other important pulses are lentil (6%), field pea (5%), lethyrus (2.66%), mooth bean (2%) and horse gram (1.5%). Madhya Pradesh is the highest pulse producing state accounting for 28 per cent of Country's total pulse production followed by Maharashtra (11.97%), Rajasthan (11.38%), Uttar Pradesh (8.39%) and Karnataka (8.10%). If we see that acreage under pulses during 2016-17, Madhya Pradesh again contributes highest area under pulse (21.30%), followed by Rajasthan (16.65%), Maharashtra (14.96%), Karnataka (9.85%), Uttar Pradesh (9.05%), Odisha (5.55%), Andhra Pradesh (4.26%) and Chhattisgarh (3.9%). During last 27 years (1990-91 to 2016-17), production of pulses increased at the rate of 1.60 per cent /per annum. The rabi pulses increased at the rate of 1.88 per cent/annum while kharif pulses increased at the rate of 1.06 per cent/annum. The production of pulses was hovering at 10-14 million tonnes up 2009-10; however, production increased to 18.24 mt during 2010-11 and further to 19.25 mt during 2013-14. Thereafter production declined for two consecutive years 2014-15 to 2015-16 due to continuous drought in kharif, and unseasonal rains and hail storms during rabi season. Inspite of increase in area during 2015-16, the declined production of chickpea reflects the effect of abrupt weather during 2015-16. Good monsoon coupled with policy initiatives and strategies adopted by Government of India, high market prices, etc. could add additional 5.38 m ha of area under pulses during 2016-17 over 2013-14 and as a result, production of pulses is expected to reach all time high at 22.14 mt. The additional area of 5.38 m ha was mainly contributed by pigeon pea and black gram (1.38 m ha, each) and green gram (1.07 mha). The increase in area under pigeon pea was in central and south-western states namely Maharashtra (0.4 m ha), Karnataka (0.37 m ha), Madhya Pradesh (0.23 m ha), Telangana (0.17 m ha), Gujarat (0.14 m ha) and Andhra Pradesh (0.12 m ha). In case of black gram, the additional area coverage was mainly in Madhya Pradesh (47.71%), Rajasthan (18.88%), Odisha (13.75%), Maharashtra (9.74%), Gujarat (9.17%) and Uttar Pradesh (8.51%). The rabi black gram was mainly increased in the state of Andhra Pradesh. An additional area of 1.07 m ha under green gram was shown out of which more than half was in the state of Rajasthan (52.52%). High prevailing market prices of pulses is one of the important factors in increasing production of pulses. An increase in area of more than 40 per cent under pigeon pea clearly indicates the effect of prices on it. If we see the increase in Wholesale Price Index of important agricultural commodity, there was increase of 77 per cent point in WPI of pulses during 2015 as compared to previous year, whereas it was almost constant in case of cereals and oilseeds. Among the pulses, the highest increase was in black gram (117% points) followed by pigeon pea (100% points), lentil (75% points), gram (62% points) and green gram (60% points). Farm Harvest Prices of pulses were also increase (pigeon up to 62% and of chick pea up to 30%) during 2014-15 as compared to 2013-14. The recent supportive government policies initiatives including increase in Minimum Support Prices of pulses coupled with enhanced procurement of pulses, has stimulated the pulse production in the country during 2016-17. During recent years the Government has increased the MSP and bonus on pulses substantially (16 to 34 % increase during last three years). There has been increase of MSP during 2016-17 to `5050 (increase of `750) for pigeon pea, `5000 (increase of `700) for black gram, `5225 (increase of `725) for green gram, `3950 (increase of `1000) for lentil and `4000 (increase of `9000) for chickpea, substantially higher than MSP of 2013-14. Increase in MSP is also supported by procurement of pulses. 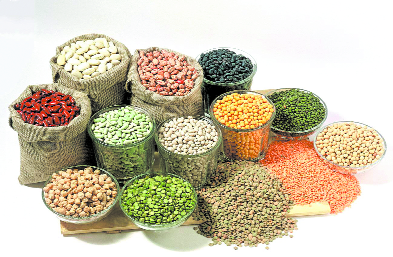 Recently, the extent of buffer stocks of pulses has been increased from 8 to 20 lakh tonnes and during 2016-17 nearly 20 lakh tonnes of pulses were procured by National Agricultural Cooperative Marketing Federation of India Limited (NAFED), National Cooperative Consumers' Federation (NCCF), Central Warehousing Cooperation (CWC) and Small Farmers Agri-Business Consortium (SFAC) as compared to 5.04 lakh during previous year. One of the important strategies adopted by Government of India is extension of operational area of National Food Security Mission. In the year 2013-14 under the National Food Security Mission only 482 districts of 16 states were included. Now 638 districts of 29 states have been included in this plan. Goa, Kerala and 8 north eastern states and 3 hilly states have now been included in this mission. New initiatives like distribution of seed mini-kits, subsidy on production of quality seed, creation of 150 pulse seed hubs for ensuring availability of quality seed, strengthening breeder seed production, strengthening/establishing production units of bio-fertilizers and bio-control agents at ICAR institutes and State Agriculture Universities (SAUs), cluster frontline demonstrations through KVKs (demonstration in 31,000 hectares by 534 KVKs with special focus to Eastern India and rice fallow area) are being undertaken under NFSM to increasing productivity and production of pulses in the country. The breeder seed production was increased from 82.29 thousand quantal in 2013-14 (a normal year) to 90.37 thousand quantal during 2015-16 (deficit rainfall year). A programme on Additional Area Coverage of Pulses during rabi/summer 2016-17 was also launched to increase production of rabi/ summer pulses through area expansion of rabi pigeon pea, gram, pea and lentil during rabi and green gram and black gram during summer. Similarly, Crop Diversification Programme implemented in Original Green Revolution States, viz. Punjab, Haryana and Western Uttar Pradesh as a sub-scheme of RKVY since 2013-14 to divert the area of water guzzling paddy to alternate crops like pulses, oilseeds, maize, cotton and agro forestry with the objective of tackling the problem of declining of soil fertility and depleting water table in these states. In order to encourage tobacco growing farmers to shift to alternate crops/cropping systems, Crop Diversification Programme has been extended to tobacco growing states of Andhra Pradesh, Bihar, Gujarat, Karnataka, Maharashtra, Odisha, Tamil Nadu, Telangana, Uttar Pradesh and West Bengal to encourage tobacco growing farmers to shift to alternate crops/cropping system w.e.f. 2015-16. For promoting pulses in rice fallow areas in Eastern India, a new initiative launched under RKVY as a sub-scheme to bring area of rice fallow in Eastern India under pulses and oilseeds cultivation. The additional area of 1.09 m ha under rabi pulses mentioned earlier is only contributed by these Easter rice fallow states namely Chhattisgarh, Bihar, Jharkhand, Odisha and West Bengal substantiates the impact of programme on bringing area under pulses in rice fallows. Similarly, component wise financial provision for promotion of farmer producer organizations (FPOs) and marketing support for value chain integration includes marketing support to unregistered farmer groups, Self Help Groups (SHGs), SHG federation etc. for local marketing of pulses and millets (@Rs.2.00 lakh per group of 15 farmers, for one time support only) which enables unregistered farmer groups, SHGs of women and others who wish to collaborate informally for direct marketing pulses in local haats, townships. Some of the important technological that affects production of pulses are selection of crops and varieties fitting to rice fallow areas, inclusion of legumes in rice-wheat cropping system helping not only help in increasing production of pulses but also to improve sustainability by restoring soil fertility and reduce other associated problems, shifting the upland paddy by pulses, pulses at high altitude, inter-cropping of pulses, sequential cropping, utera cultivation, promotion of rabi pigeon pea, low/no-cost management practices such as plant geometry, time of sowing, depth of sowing, optimum seed rate, etc.